I’m a Pirates fan. Recently, that has become easier to say in public, but it doesn’t take a good memory to recall that the Pirates have not had a winning season since 1992 (20 years total). In terms of baseball curses, this would be The Curse of Barry Bonds (skinny Barry Bonds). During that time- they’ve become the poster child for “how not to run a professional organization.” Thankfully, our new leadership has our Buccos headed in the right direction- and currently 12 games over .500. The Pirates have been losing for 19 years. They last had a winning team when I was 13 years old (I’m now 33). When the losing began, we just thought it was a down season- never did we think that it would turn into two whole decades- a generation lost as Pirate Fans. In my own odd way, it led me to think about Jesus’ disciples when Jesus ascended into heaven in Acts 1:9. As Jesus left, two men dressed in white told the disciples that Jesus would return as they had seen him return to heaven (Acts 1:11). The Kingdom of God would be fully realized. Did the disciples think that would happen immediately? Certainly this could be a possibility when they witnessed Jesus raise from the dead. But days turned into weeks, weeks turned into months, and months turned into years, years have turned into 2,000 years. I doubt that the earliest disciples would imagine that Jesus’ returned would be delayed this long- but through it- we continue to have hope that God’s Kingdom will be fully established on earth. 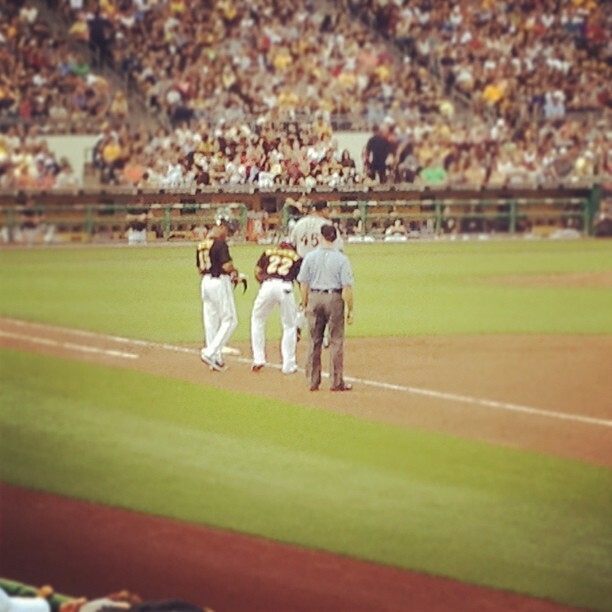 Andrea and I had the chance to go see the Pirates play while on vacation. We saw them play the Marlins and was part of the 5th largest crowd in PNC Park history (even if you’re not a Pirates fan- you should go see PNC Park!). During the game- I began to think about how excited I would be to see the Pirates have a winning season and get back into post-season baseball. I have to admit, I continually reload my twitter feed during Pirates games (and after being back in PA, I’ve come to the conclusion that Twitter is better commentary than radio announcer Greg Brown)- and that would only intensify as the Pirates close in on a winning season and maybe a playoff spot. I’d watch the games, buy the T-shirts, and rejoicing about it wherever I went. The question is this: Do we live our lives as if we believe? Do we live our lives as people of HOPE? This entry was posted in Uncategorized and tagged Hope, Pirates. Bookmark the permalink.